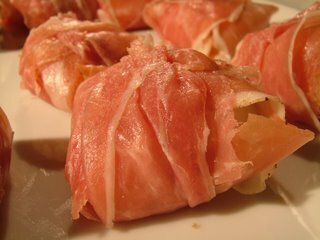 Waitrose is currently carrying a really good prosciutto affumicato – a cold-smoked, raw Italian ham. It’s delicious straight out of the packet, but I’ve been wondering for a few weeks what I could do with it in a recipe. It needed to be something simple; this stuff is very good indeed, and deserves not to have its flavour masked with too many other ingredients. The answer came to me at the fish counter at the end of the day. There were a dozen queen scallops left – small, but sweet and firm, and not pumped full of weight-increasing water. (If you are shopping for shucked scallops, ignore any which are soft and white – they will be full of water. A non-watered scallop is a creamy colour, and is sometimes tinted the palest pink.) They were labelled with some money off, since they’d have gone out in the trash at closing time if they’d not been bought. I snaffled them along with a dozen slices of the prosciutto and ran in the direction of my frying pan. Pork goes curiously well with shellfish. One of the most memorable meals I’ve had in years of French eating – I even lived in Paris for a bit, hunting down that perfect supper – was a silky, heady casserole of pig’s trotters and beautiful baby clams. (The restaurant was le Pont de l’Ouysse in the Dordogne, for those doing the stereotypically British thing this summer. Turn your speakers off before clicking that link – there’s French electric guitar midi on the jump page.) Of course, the Chinese specialise in the pork/shellfish combination; much of the filling in your dim sum is made from a minced prawn and pork mixture, and some of the more wonderful things I’ve had with scallops, preserved oysters and abalone have been heavy on the stewed belly pork. This being the case, I got some Chinese chilli oil out of the fridge to go with the scallops. I usually have a few jars on the go; one with a dried shrimp base, one with just garlic and chillis (surprisingly good in Italian sauces) and one with a dried scallop base. This was Way On‘s XO scallop version (many Chinese supermarkets in the UK carry it – if you can’t find it, use one with shrimp), and it finished the dish beautifully, making the scallops darkly rich and spicy without tasting characteristically Asian. 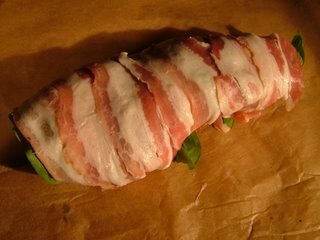 Wrap each scallop, parcel-style, in a piece of the prosciutto. 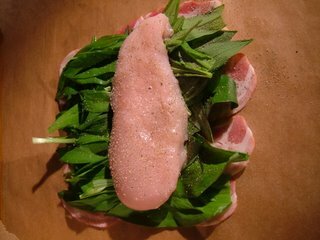 You don’t need to secure with a skewer; the ham clings to itself nicely, and once heated will not be soft enough to unravel. 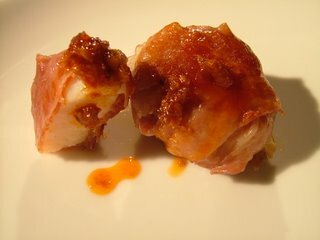 Don’t season – there’s plenty of salt and spicing in the ham, and you’ll get heat from the chilli oil. Heat the olive oil over a medium flame for a couple of minutes. Cook the scallops for precisely four minutes on each side (you want the ham to be crisp and golden where it’s touched the pan, but the scallops should be only barely cooked in the centre to keep them sweet and toothsome). Remove to a serving dish and drizzle with the chilli oil – it’s packed with searingly hot chillis, so a little goes a long way. Serve with crusty bread and a Sauvignon Blanc. Banoffee pie is one of the easiest desserts to make – there’s no real cooking involved, just some butter-melting, some biscuit-smashing, some pre-emptive tin-boiling, some cream-pouring and some banana-slicing. Easy as . . . pie. The gloriously gloopy toffee stuff in a banoffee pie is dulce de leche, an Argentinian caramelised milk sauce. 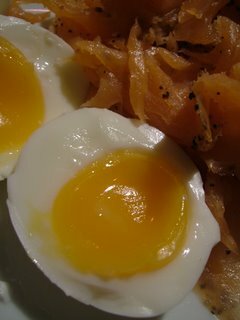 You can buy it in jars from Merchant Gourmet in most supermarkets, but it’s very easy to make at home. Just cover an unopened tin of condensed (not evaporated) milk with water in a saucepan and boil for an hour and a half, making sure that the water stays topped up. The can won’t come under enough pressure to go pop. When your dulce de leche is finished, it will keep indefinitely in the can; I like to make several cans full at a time and keep some in the cupboard for my emergency pie needs. Use a permanent marker to identify your boiled tins – the paper will have come off them. 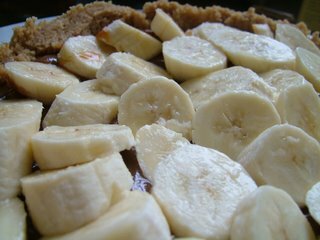 Banoffee pie uses a cheesecake base, which is easy to prepare and freezes well. If you make some spares and freeze them, you’ll have a near-instant dessert for the next time you have visitors. Line a springform cake tin with greaseproof paper. Crush the biscuits into crumbs. This takes a few seconds in the food processor, but if you don’t have one you can put them in a sealed plastic sandwich bag and wallop the bejesus out of them with a rolling pin. Melt the butter and combine with the crumbs until you have a stiff paste. Mould the paste in the bottom of the tin until you have a flan base with shallow sides. Don’t worry about being too tidy; you’ll be covering the base up in a while.Put the cake tin in the fridge for about an hour to harden. 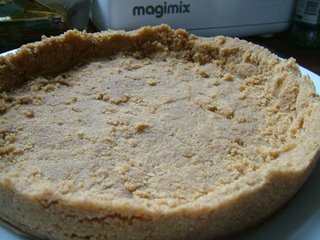 When the pie crust is nice and solid, remove it from the cake tin and spread a whole tin of cooled dulce de leche on the base. Top this with chopped, fresh bananas. Pour over gouts of cream and serve. Those having similar problems with their eggs should try peeling the egg under a running cold tap. Mr Weasel tells me that this is a piece of perfectly obvious information he too had never come across, and would like to point out that had I told him this ten years ago our relationship would be punctuated with far fewer fragments of eggshell. 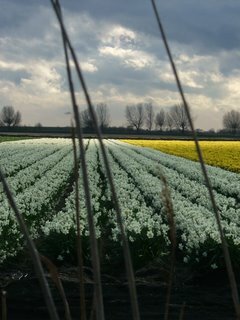 One of the nicest thing about spring in the Cambridgeshire fens is fields like these, full of daffodils. 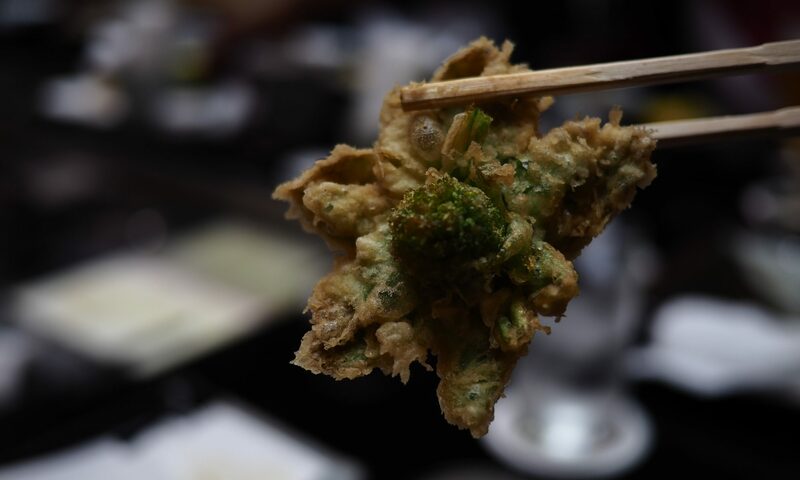 (Completely inedible, but very pretty.) I took this picture from the side of the road heading north; we’ve been away for a few days visiting family in Yorkshire. Some very good things have come out of this for later blogging, including a plastic bag full of wild garlic, a new Australian Women’s Weekly book of Malaysian recipes, three new kinds of thyme, a recipe for Fat Rascals (a Yorkshire spiced bun of exceptional deliciousness) and the most gorgeous Easter egg I have ever, ever seen. It’s my Easter egg, a present from Dr and Mrs Weasel Senior. (I suppose that at least half of it belongs to my husband, but I am hoping he will mistake it for some art and fail to eat it.) A picture can, in this particular case, speak a thousand words; isn’t it beautiful? 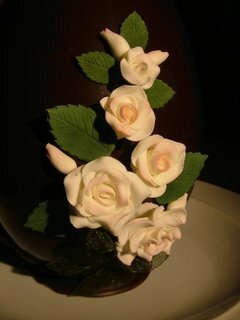 These eggs are handmade at the Betty’s bakeries – the glossy dark chocolate has hand-moulded icing roses all over the front. I can’t bring myself to start eating it. It’s too pretty. Thanks for dropping by! Please spend a while having a browse – you’ll find all the recipes, reviews and so on in the ‘menu’ section on the left. Update, Feb 2008: Lots of people have asked me if you can freeze mashed potatoes. 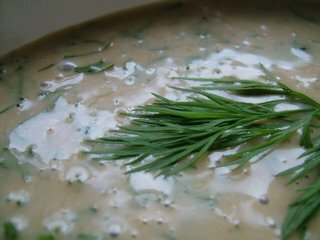 The answer’s complicated – mash will freeze, but it won’t be as good as it was fresh (it tends to change texture in a watery direction and lose some of its flavour). 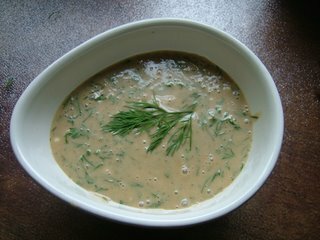 However (there’s always a however), if you want to have some spare mash kicking around to top shepherd’s pie, thicken soups or use as a base for fishcakes, it’s worth freezing individual portions to use in these recipes if you have some left over. 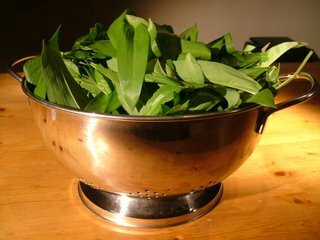 Heat the portions for a while in a saucepan once defrosted to evaporate out some of the water before using. Mashed potatoes are probably my favourite comfort food. One of my earliest memories is that of my mother coaxing me away from the brink of death by measles with plain mashed potatoes and a little gravy. 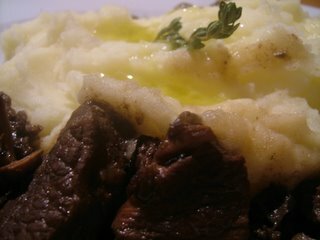 The mashed potatoes I dream about are not mashed potatoes spiked with mustard or garlic; no pesto colours them bright green for me. I like my mashed potatoes spiced gently with black pepper and nutmeg, and with plenty of salt. Some cooks will tell you to use white pepper for aesthetic reasons; I see nothing wrong with a few black specks in my mash, especially given that freshly ground black pepper tastes so much better in this dish than white does. The potato you choose is important. 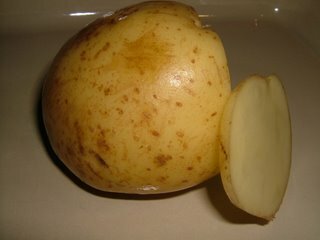 Potato varieties can be split into two groups – waxy and floury. 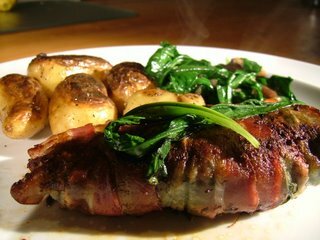 Waxy potatoes keep their shape well when cooked and are excellent in gratins – they remain quite moist when cooked. A floury potato cooks to a drier, more fluffy finish, doesn’t hold its shape well, and should be your potato of choice for mashing. My great-grandma used to mash potatoes to lump-free perfection with a fork. God knows how. I use a bog-standard potato masher. Excellent results can be reliably achieved with a potato ricer, which sort of extrudes the cooked potato through tiny holes. Regular readers will know that I’m always chary about buying single-use devices, so I stick to my masher, which also gets used for other generalised vegetable-squashing tasks. Whatever you do, don’t use a food processor. I am not quite sure about the physics behind this, but any high-intensity processing of the sort you get with a Magimix makes the potatoes very slimy and not very appetising. Hold the milk pan in your left hand and a wooden spoon in your right, and pour the milk into the mashed potatoes in a thin stream, beating it in with the wooden spoon. Serve immediately – these will be the creamiest, most delicate mashed potatoes you’ve ever eaten. If you’ve any left over, keep them in the fridge and make fishcakes tomorrow. We’ve done Spanish omelette before – this one really takes the biscuit, though, and deserves its own spot. Asparagus is appearing in the shops (early – it’s from continental Europe); tiny, sweet sugar snap peas (Kenya – the food-miles-goblin has been doing his work this week) are on the shelves, and suddenly my habit of buying emergency chorizo whenever I see it does not look so daft. This recipe works best when the vegetables you use are sweet either through long, slow cooking (the onions and red pepper) or through their near-raw freshness (the asparagus and peas). Combined with soft potato, which takes on all the flavour of the onions, and with salty, spicy chorizo, these sweet vegetables become something very special. Start by sauteeing the onions gently in the butter for ten minutes in a large non-stick frying pan, stirring occasionally. Add the potatoes and the peppers, and continue to cook for another 15-20 minutes, until the potatoes are not so soft they’re collapsing, but pleasantly toothsome. 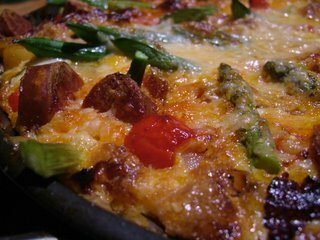 Mix the chorizo, peas and asparagus with the ingredients in the pan, and quickly beat the eggs with some salt and pepper. 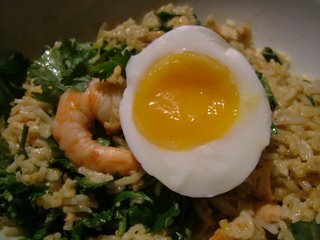 Pour the eggs over the mixture and cook for another ten minutes. Sprinkle the tortilla with the cheese (don’t smother it; this is for colour and a kick of flavour, not a duvet) and bung the whole pan under the grill for 5-10 minutes, until the egg mixture is cooked through and the top is bubbling and crisp. Serve with a green salad.